Disclaimer: I’m not a professional reviewer and these opinions are mine and mine alone! 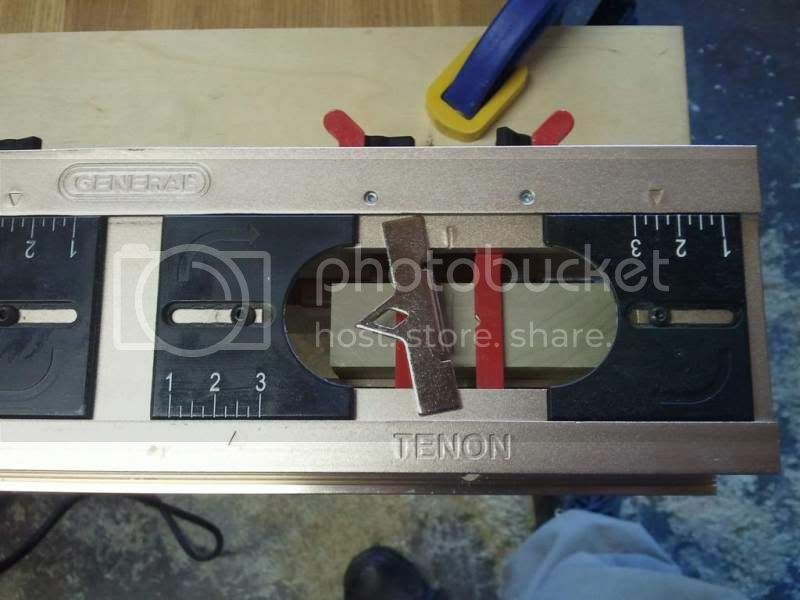 I first saw this jig in magazine adverts about two months ago and have had a couple people ask me about the jig, but I hadn’t actually seen one until last night. 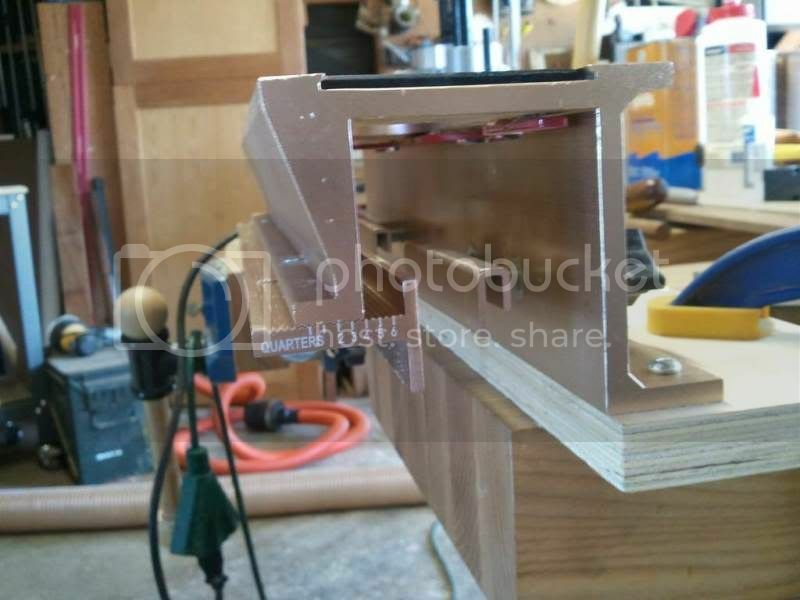 I was able to procure the jig, spent last night reading the directions and checking out the General Tools Website videos, and today I tested the jig over several hours with the following results. The jig specifies that it is capable of handling stock from 1/2” to 1 1/2” thick; so I took some undesignated project wood and spent an hour or so milling it flat and square in 1/2”, 3/4”, 1”, and 1 1/4” thicknesses. I ripped pieces at 1 1/2” (face framing), 2 1/2” and 4” wide. The manual states that you can do long pieces but doing so would not allow you to cut the tenons at the same time as the mortise. Not a big deal, but aligning the long piece on the jig as designed would be challenging at best. More on alignment later. a bit, which the manual states is a spiral upcut bit but instead is a straight flute cutter. Also included is an alignment tool which I will show in a later picture. 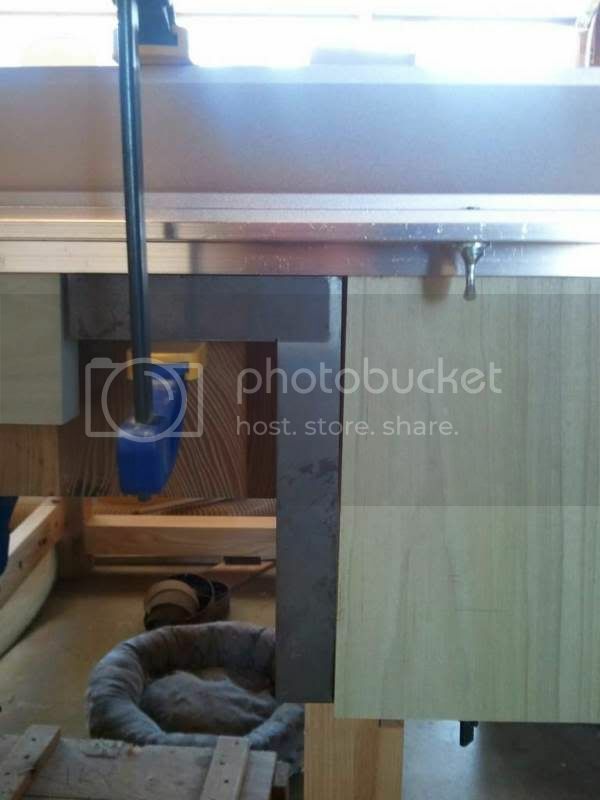 Opposite the centering fence are the face clamps which secure the workpiece against the centering fence. 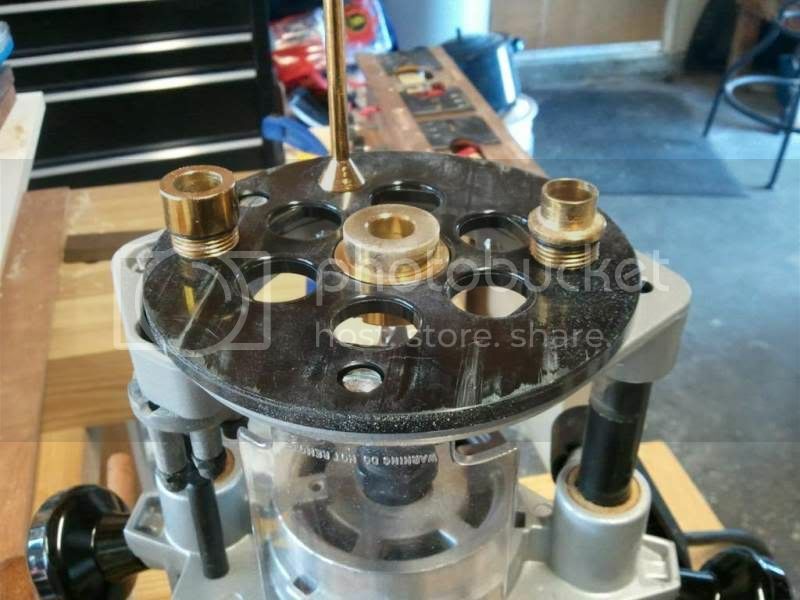 They are a ‘U’ shaped bracket with two knobs to allow you tighten from the back side of the jig. A minor complaint is that if you turn one knob too much more than the other you bind the face clamp and have to back off a bit. So I found you turn one knob a full turn and then the other. Turn the knobs until you’ve lightly secured the workpiece in the jig in preparation to align the workpiece both vertically and horizontally. 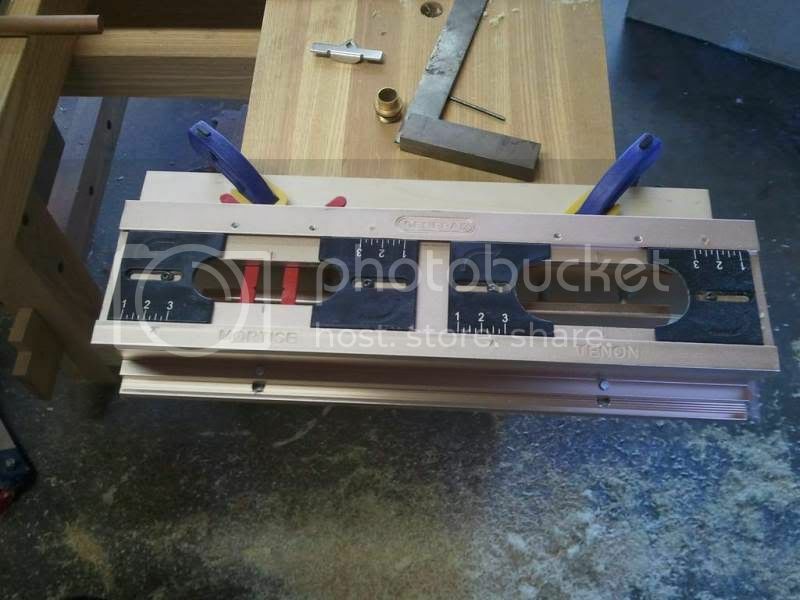 Additionally, the tool is not long enough to reference against the sides of the jig so it is easy to misalign. All of these can be overcome, but only once you know about them. They don’t seem to add to the EZ part of the jig. 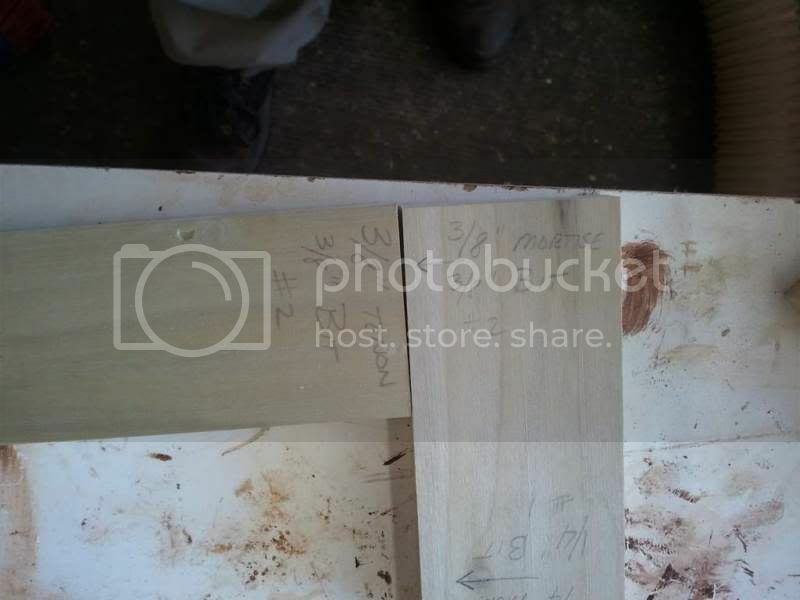 The next step is setting the length of the mortise and tenon. 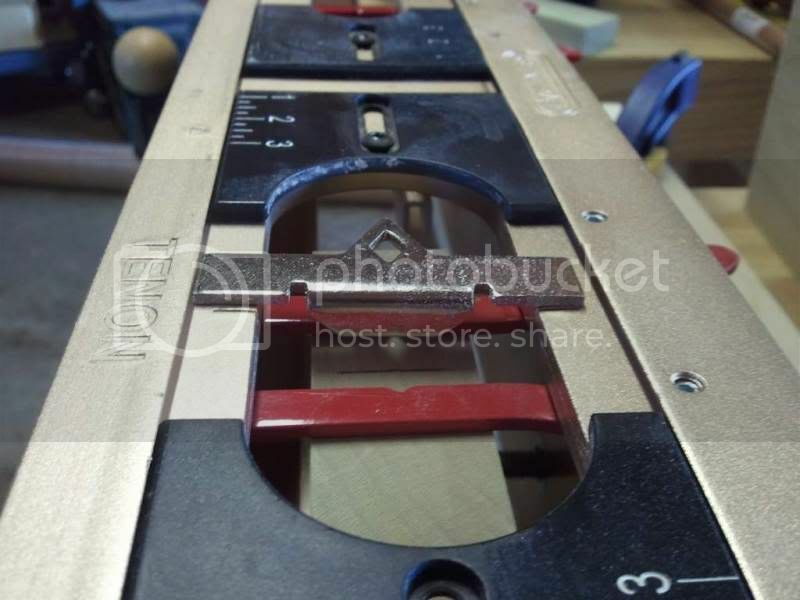 A stamped arrow (visible in the above picture) on the jig allows you to set the graduated scale on the guides. All four guides need to be adjusted to the same setting. The black plastic guides are dovetailed into the side of the jig and seemed to stay mostly square to the edges. The aforementioned hex key is used to loosen and tighten the screws that lock the guides once properly positioned. A chart in the manual shows what the actual M&T length will be based on the guide setting vs. the bit being used. In general when using the 1/4” bit, the length will be 1/8” less than the guide states; 3/8” will be exact, and 1/2” will be 1/8” longer. One of the last steps in prep is to set the depth of the plunge cut. 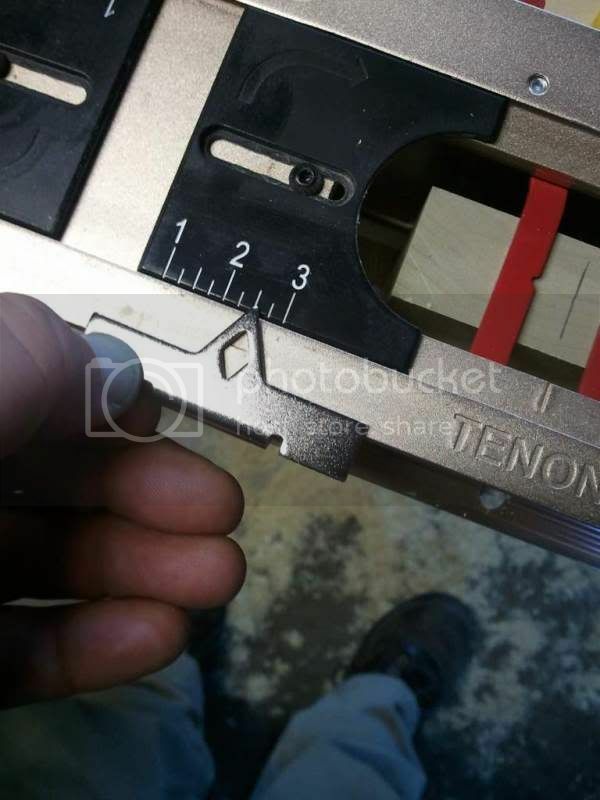 The manual states you add 1/2” to the depth to account for the bushing (ie, a 1 1/2” plunge to make a 1” deep cut) and recommends setting the mortise slightly deeper to accomodate glue. Checking the actual length of a cut tenon showed it to be about 1/16” shorter than desired, again, probably not a big issue. When cutting the mortise, you will always use the 1 1/8” bushing, but when cutting the tenon, you will switch the center of the bushing as indicated in the manual; a process that only takes about 15 seconds. This is the first indicator of the positioning bars not actually squaring up the workpiece, and I attributed that to me probably placing too much pressure against one of the bars and causing the non-square result. 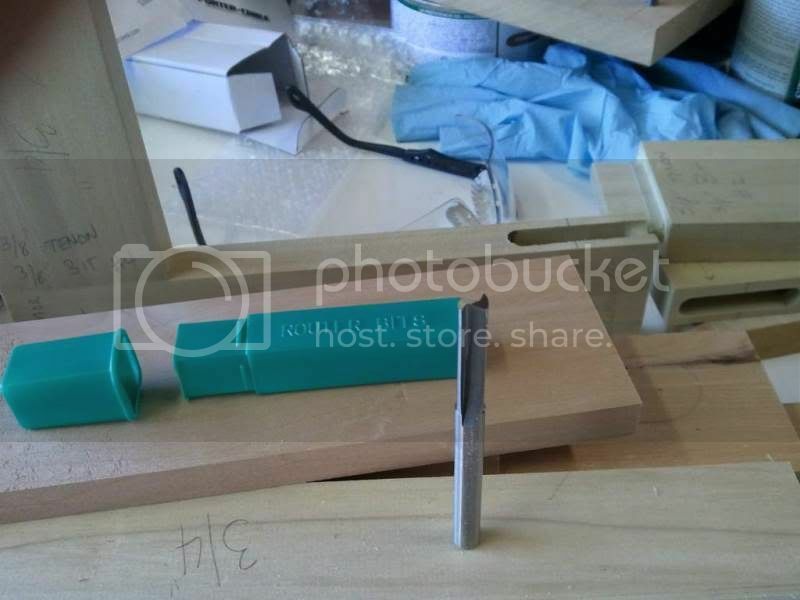 The joint is also not flush at the end which is a factor of trying to adjust the mortise and tenon length guides. All the guides are supposed to be set the same (ie, all to 2 1/2” mark). However, the adjustment is done by eyeball, and if eyeball fails, you are supposed to use the alignment tool again. The diamond cutout in the alignment tool is supposed to allow you to match up to the stamped arrow and more precisely set the guide length. This works on one side of the jig, but if you look at the pictures the top edges of the jig aren’t equal; one is wider than the other. On the narrower edge you can either put the edge of the alignment tool against the jig which covers the scale (in hindsight I guess you can see through the diamond, but I still don’t see how this helps much if at all because there isn’t a good way to actually match the stamped arrow to the alignment tool) or you can align the diamond with the arrow without really registering against the edge of the jig so you’re back to eyeballing, the thing the alignment tool was supposed to help with. 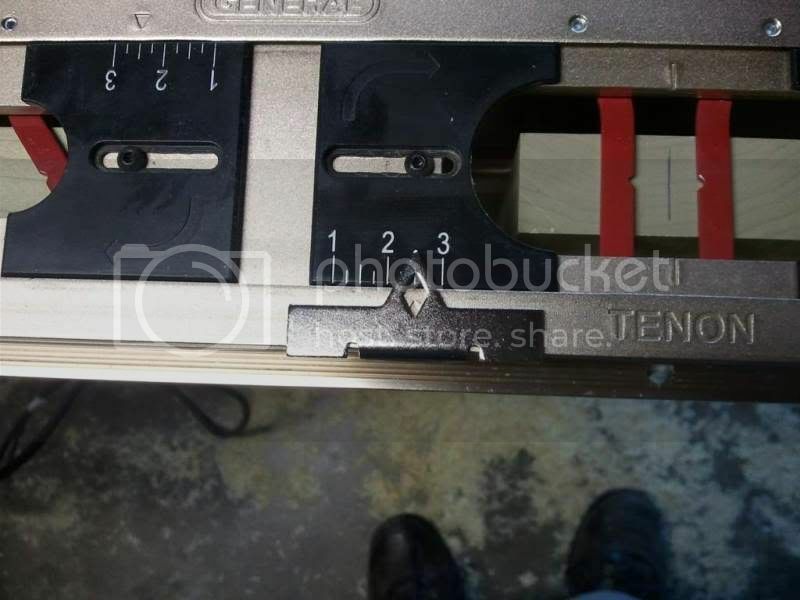 Additional testing of the jig showed that at the 1” minimum length setting the alignment tool was too wide and covered the centering stamp marks completely, forcing you to rely on eyeballs. 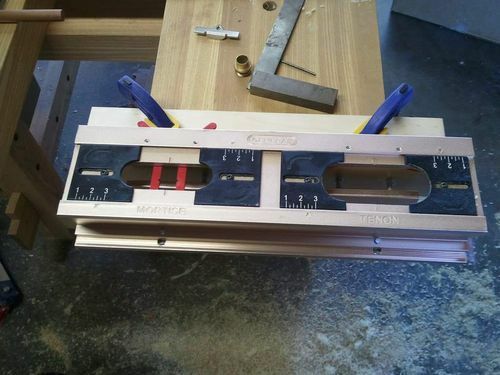 Either the edges should be equal width or, alternatively, put all the template scales on the wide side of the jig instead of alternating narrow and wide. I started looking into why this happened, and what I found was that the entire jig body flexes as you tighten up the face clamps. What I found in retesting was when I cinched in the mortise piece and then the tenon piece, the mortise face clamps had loosened. I didn’t think I was tightening too hard, but apparently I was wrong. So it becomes a balancing act between tight enough to hold during routing and too tight. Probably some sandpaper stuck on the centering fence and the face clamps would be quite beneficial. This happened on a later piece of wood; so even when I was mindful of the problem, I was still sometimes unsuccessful at avoiding it. I set up my 1 1/2” face frame stock and found out that the mortise side of the jig simply won’t clamp it because the face clamp and centering clamp don’t extend high enough to capture the wood. 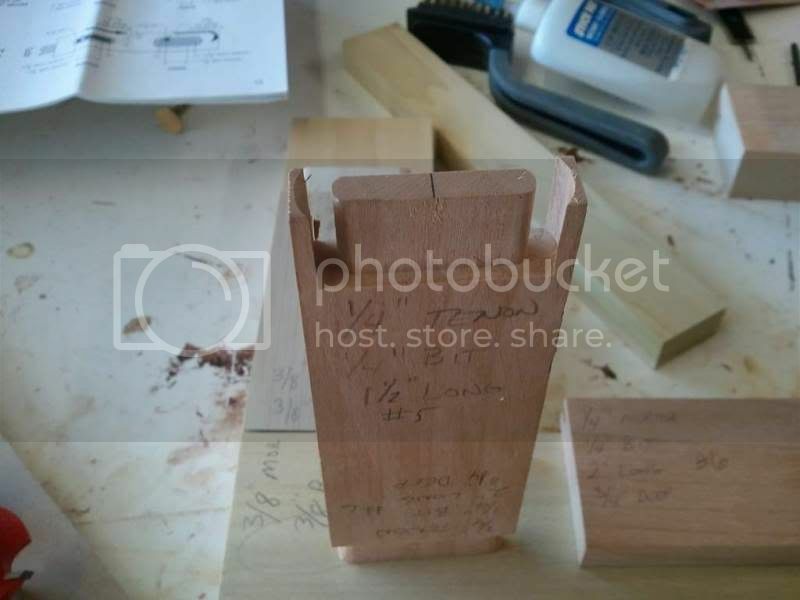 It seems that 2” is about the miminum width that the jig can work with; so if you’re looking do to M&T on narrow stock, you will either have to mill it wide and rip narrower after cutting the mortise or find another way to cut the mortise. I would have to say that my final impression of this jig isn’t as favorable as I was hoping when I started. It is not a bad product and it will get the job done provided that you are willing to work around several limiting factors but it certainly isn’t an ‘unpack and go make a perfect M&T joint’ device. I have started brainstorming ways that I might increase the accuracy of set up while eliminating eyeballing, parallax and flexing bars. If I come up with something reasonable I’ll post more pictures. I am confident that ingenious woodworkers will start to adapt this jig and that feedback will hopefully lead to product improvements. - Redesign the positioning bars to make them more resistant to flex and to be of more use in squaring up stock. Great review. Thanks for posting it. THX for detail review and awesome pics. 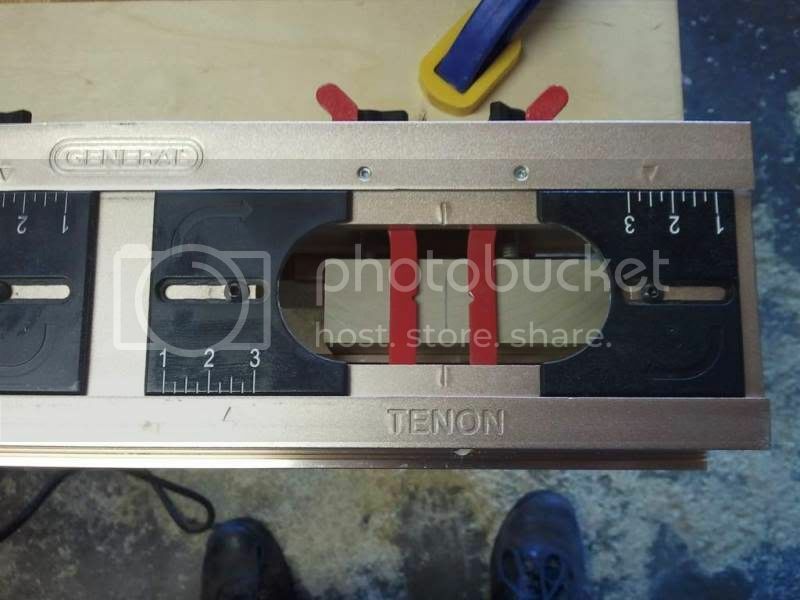 These types of jigs for Mortise & Tenon are way too time consuming and the length of the stock is limited to the height setup. Accuracy is hit and miss at best. Thanks for the review. I was really interested in getting one of these, but not so much anymore. Daniel just reviewed the leigh fmt on our website, the review was a bit more pleased with this tool than you were with the general. Your review was well done since this is a comparable machine you may want to read this review too click here http://www.thisoldworkshop.com/index.php/reviews/106-leighmt and or copy the link to your browser. 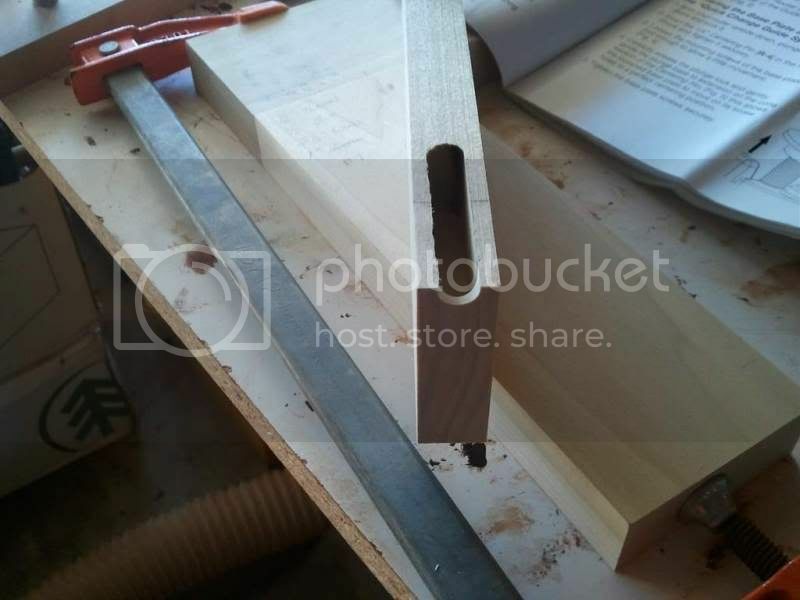 I don’t think Daniel had the same problems with the flanging, i am not sure if it is supposed to do that or if the formula is bad for the tenon, any way you did a good job. i can telll you the one thing we do differently is we take days to learn all the problems and how to fix them before we do the review. That’s why we take so long to do a review we feel we have to know if its the user or the tool if its easily mastered. few things are perfect out of the box and you could have given it a week or two and worked out the bugs and offered us a complete review with your solution’s since your lay out is so good this one little bit of advise and you could be a pro at reviews. now this is an informative & well done review. thank you. Thanks, I just saw this in a magazine over the weekend and was wondering where I would get the money for one. Maybe I’ll hold off for awhile before spending $150. I thought it looked too good to be true. Can you cut angled or compound angle M & T joints? As far as the alignment tool – could you just make a little wood t-bar that extends all the way down to the workpiece for easy marking? I agree with you their alignment tool looks like an afterthought. Thanks Dyanablue for the in depth review! I drooled over this jig thinking it would be a great alternative to buying a costly dedicated mortise machine/”dust collector”(joke)This jig had a odd coming out party and took a long time to come to market witch left me with a lot of questions even before this jig hit the shelves now I know why.I don’t do a lot of mortise work but would like the capability.You have saved me a lot of aggravation and dismantlement,thank you, this is just what this web site is all about!!!!! I kinda wonder how well those $800 +jigs perform? ? ?? nice review with pros and cons! tanks for save me 150 bucks ! Wow. Thank you so much for an incredibly informative and detailed review. This reviews saved me the trouble of buying one and finding out what you revealed here. I don’t know if anyone is still watching this thread but I have a question. I have just received my M/T jig and first impressions leave me a wishing I had read this review before buying. I haven’t even tried the jig yet but right away I am noticing a lot of slop between the guide bush and the mortising guide (between 1/64 and 1/32). I am wondering Dynablue if you experienced the same thing. I will be trying the jig today to see how it affects performance but it doesn’t give me hope. 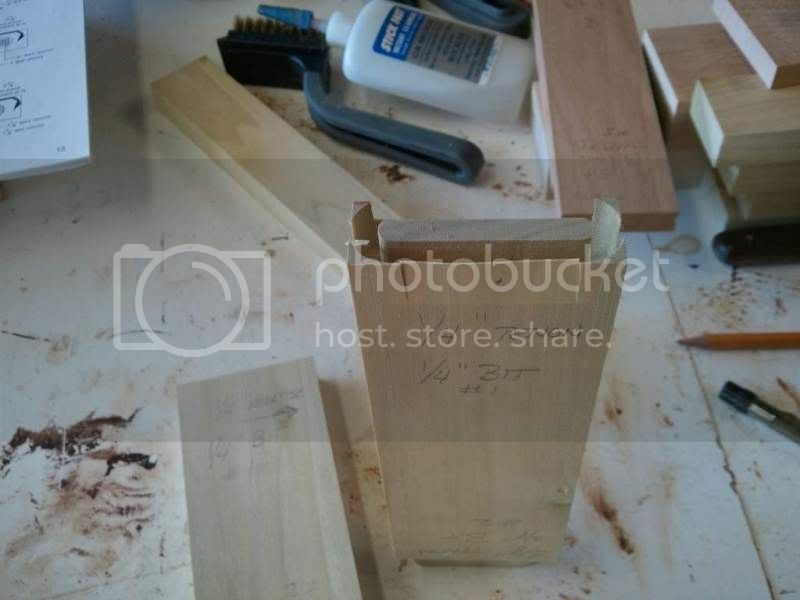 I have recently had the opportunity to try this jig, and I was able to make a test mortise and tenon joint. I like the quality of the jig, but I have a few suggestions for the designer who I know is following this blog. I like the quality of the jig. The screw in bushings are nice and a necessity. I read the review by Dynablue and share most of his observations. However, I had no problem with the set up fingers as he did. He was concerned about give/bending of the fingers and not getting square joints. I tried to duplicate his concern about bending, and found it would take a lot of force to do so. Just placing the wood firmly against the fingers, I was able to make a square joint. 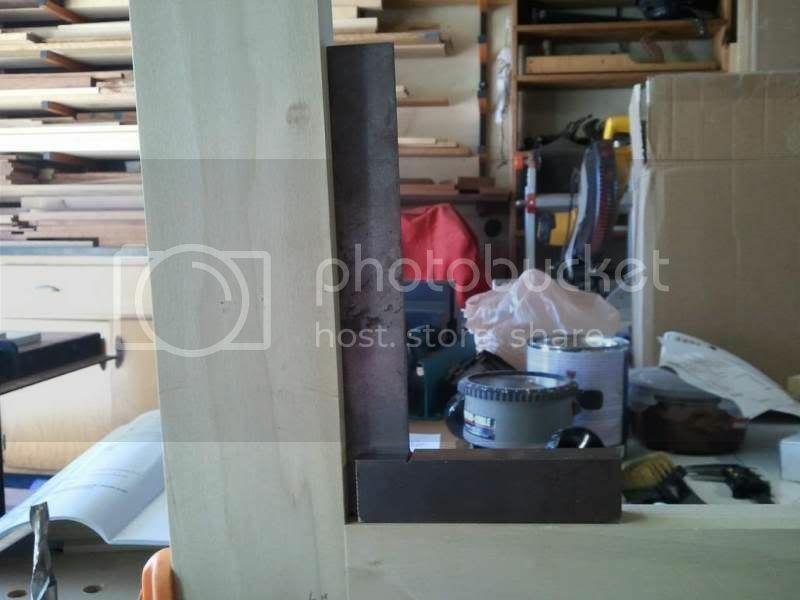 Also, the addition of the Squaring adapter should alleviate his problem of square joints and it is a welcome addition for making repeat cuts without measuring and marking each joint. The front fence is calibrated based on sawmill references: 2 quarter, 4 quarter, etc. Note that not all boards are not going to comply exactly – some will be exactly 3/4” others may be over or under, for example. 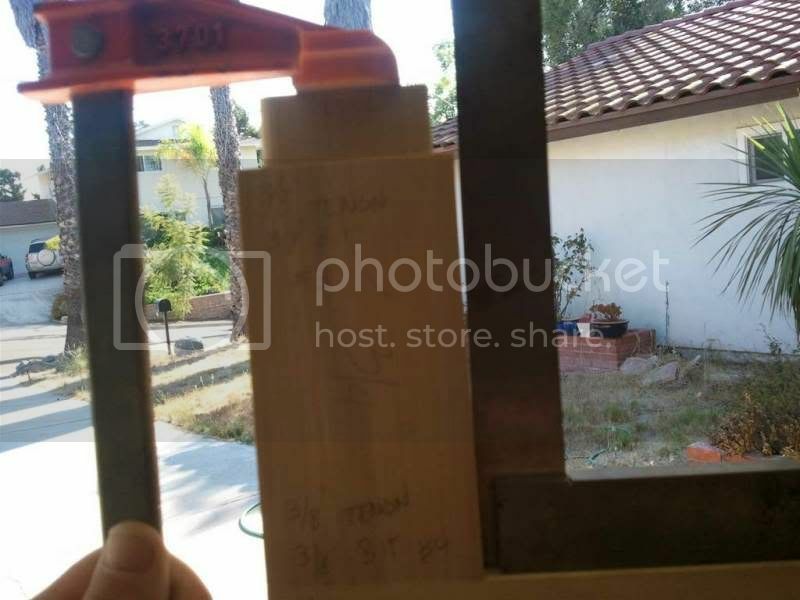 I think the front fence should have a crank, knob, or other means of adjustment so the work can be easily centered in the template window. However, if the wood is always oriented with the same face to the front or back, there is no need for PRECISE centering. It still would be easier to approximate quite accurately with a different means of adjustment. I was going to complain about the lack of a settable stop for repeat cuts ,but then discovered the squaring/stop accessory. Seems the manufacturer is getting feedback and listening to it. Plastic template width adjusters. I am afraid that repeated movement and squeezing the set screw will wear out the plastic guides quickly.